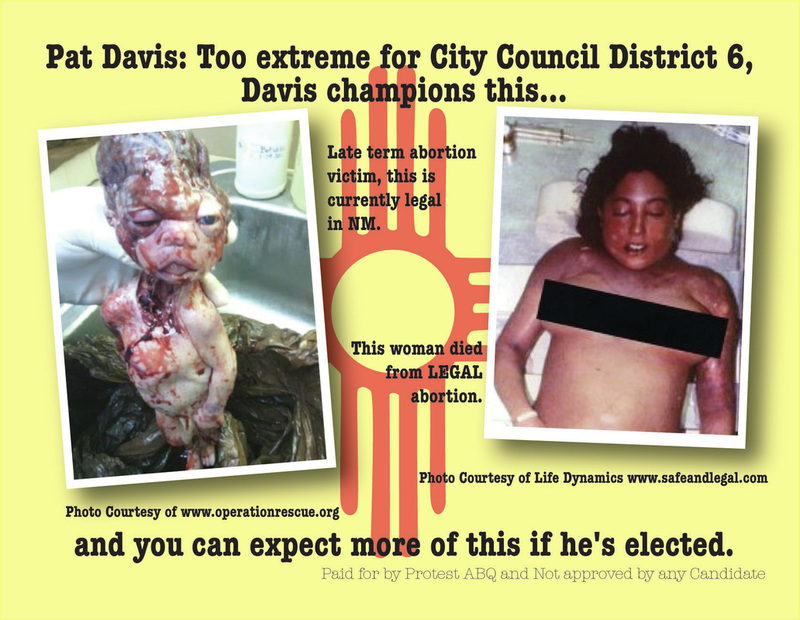 Albuquerque, NM- On November 19th the Albuquerque Board of Ethics ruled that Protest ABQ violated the city’s election code when postcards were mailed to residents of District 6 that showed the pro-abortion position of Pat Davis who at the time was running for city council. An employee of Pat Davis filed the initial complaint. 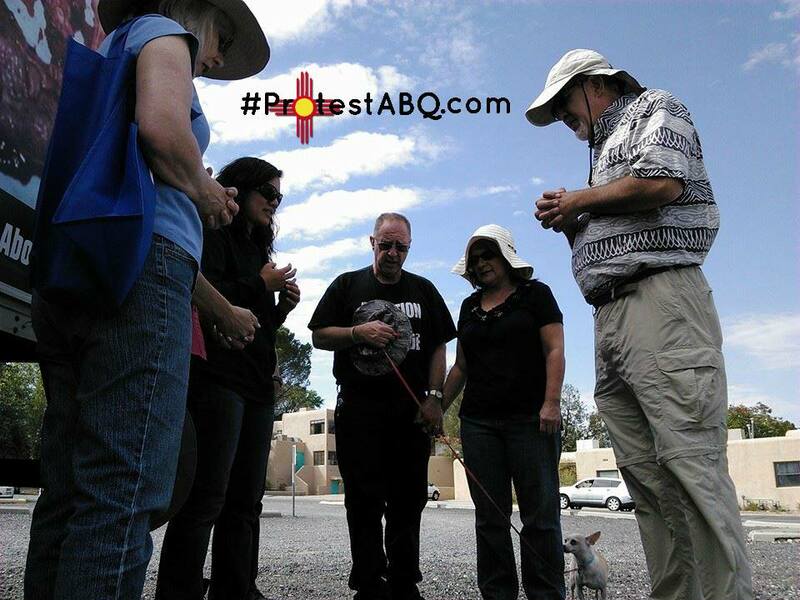 ​Protest ABQ believes that the city’s election code is unconstitutional. The code currently requires that if any individual or group spends $250 or more in support of, or in opposition to a candidate for city office, they must register with the City Clerk’s Office, submit “campaign spending” financial reports, establish separate bank accounts for any such spending, attend a mandatory meeting prior to the election, are subject to having their books audited, and comply with other administrative and regulatory requirements. During the hearing the Board of Ethics members refused to consider whether the election code is constitutional, despite the fact that Protest ABQ’s counsel provided them with legal cases showing the it is not. See, e.g., New Mexico Youth Organized v. Herrera, 611 F.3d 669, a 2010 case from the Tenth Circuit Court of Appeals holding that New Mexico’s state campaign reporting act was unconstitutional because it automatically made anyone who spent $500 a year for “political purposes” subject to mandatory registration and reporting requirements. For this reason Protest ABQ filed a Notice of Appeal in State District Court on November 24th and plans to challenge the ruling that resulted in a public reprimand and a $1000 fine. The postcards, which were mailed as an educational outreach, featured a picture of a late term aborted child from Douglas Karpen’s abortion facility in Houston, TX as well as an autopsy photo of Marla Cardamone who was 18 at the time of her abortion-related death. As important as it is to show to the truth about what abortion does to women and children, it is equally important to make sure that our right to do so peacefully is also protected. 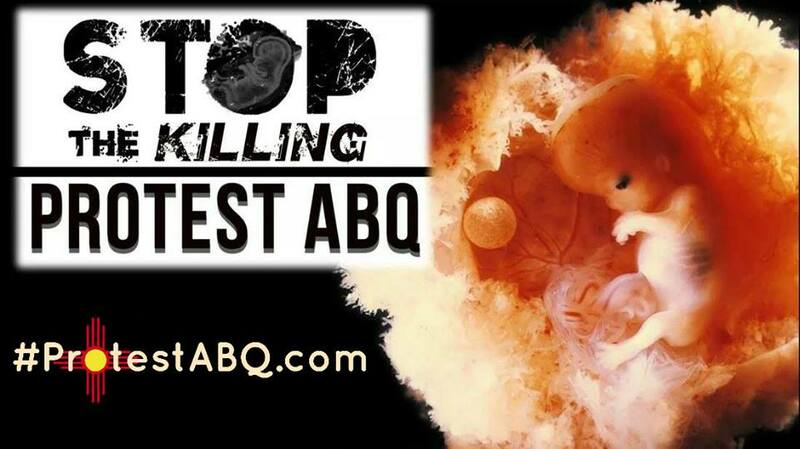 The complaint filed against Protest ABQ was merely an attempt to block our ability to show the residents of Albuquerque what happens when the abortion industry reigns out of control. Freedom of speech and the Constitution are under attack in this nation but we have the opportunity to to defend both in Albuquerque with this appeal. “The constitution exists to protect both the message bearer and message receiver. Through the constitution the founding father’s had the intent of safeguarding the ability for the general public to receive a controversial message it would receive no other way. It’s not the popular message that needs protection but the unpopular one. 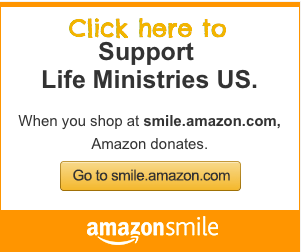 The message that saves the lives of innocent pre-born children is what we are committed to defending,” stated Bud Shaver, Executive Director of Protest ABQ. This is not the City’s first attempt to silence Protest ABQ. In recent weeks, self proclaimed pro-life Mayor Richard Berry called for Protest ABQ to stop driving the truth truck in District 6. His statements echoed Pat Davis’s own disapproval about our protests in his district. For Mayor Berry to align himself with a leftist like Pat Davis instead of taking pro-active measures and tackling the abortion crisis in his city is very alarming. Protest ABQ also found it interesting that 3 of the 4 Board of Ethics members who ruled against Protest ABQ have made political donations primarily to Republicans and those backed by Jay McCleskey. Jay McCleskey is Governor Susana Martinez’s chief political advisor and is currently under investigation by the FBI. McCleskey verbally assaulted members of Protest ABQ during a protest in 2014 and also helped Mayor Berry get elected in 2009 and 2013. Could it be that those who claim to be pro-life don’t really want to prove their worth but instead silence those trying to end abortion in New Mexico? Please pray for us and our legal counsel as we move forward with all of our efforts to stop the killing in New Mexico and protect the right to free speech. “When you hear about a gunman anywhere, your heart automatically goes out to those that are involved and the victims of such senseless violence,” said Tara Shaver. The group was quick to release a statement condemning the shooter’s actions and they say they want to make sure people realize he does not represent their views or the Pro-Life community’s.